Remember to notice the good times. I would like to mention some good times so nobody thinks the sadness sticks around all the time. Today, I managed to briefly meet friends and go to a very long doctor appointment and still had energy for the dog park. It was sunny and warm and there weren’t very many people there. Once again, I found myself smiling while walking –maybe even strutting— and listening to my music. There’s something liberating about walking in a tank top with the sun shining, a breeze blowing and not being at all cold. At least it’s liberating for someone who spends their life in close contact with either a hot water bottle, hot tub, electric blanket or electric vest (which is made for motorcycle riders, but is wondrous for freezing freaks like I). Speaking of, there was this one day years ago when my husband and I were riding our motorbikes on a hot day through the mountains. I took off my leather jacket and, for the first and only time in my life, I dared to drive fast on the country highway wearing only a tank top (and leather pants and a helmet, duh), with the wind racing over me and the sun beating down on me… My god, I will never forget that feeling. Oddly, today, smiling and strutting slowly in the park, it felt a little bit like that day on the motorbike: a lot slower and safer, but still the freedom, peace, and sun in a tank top. I thought, “the sun feels like it is physically penetrating my neck and taking away the pain”, so I went with it: I imagined that it truly could. I concentrated on that warmth and willed it to fix me. I pretended it was a known procedure with proven results and I let the sun rays massage my muscle rotten spots (they feel like they must look like rotten spots on an apple) and decided that tomorrow I was going to start winning. I am exhausted, I have a crushing headache as per-usual, and I’m currently going through a fever phase, but, I swear, this illness won’t win. I won’t feel terrible tomorrow and it doesn’t get to make me depressed. I’ll be sad when I feel like crap, I’ll still undoubtedly have a roller coaster of emotions and my commitment will falter, but, I got this. The sun gave it to me. Little darling, it’s going to be a long cold lonely winter. LDN Day 14… What if I never get better? Sometimes I don’t think I’ll ever get better. If I believed that 100%, I don’t think I could keep going, but sometimes — maybe 3 or 4 times each week — I am hit by the thought that this illness might actually never go away. It hits me like a freight train. What if I can never do the things I want to do again? And my desires are pretty simple. I want to be able to sit and have dinner with my father, husband, sister and her boyfriend and not feel sick. I want to be able to engage in a conversation with my family (or to laugh — imagine!) for longer than an hour without feeling like death. I want my body to not get so chilled to the bone that I can barely form sentences — when everyone else is in tshirts. I want to be able to hug people and sit near people without being afraid that they are going to get me sick(er). Is that too much to ask? Is it too much to hope that I will one day be well enough to engage in those simple pleasures? It’s not like I want to climb mountains or deep sea dive or walk the Wall of China. I just want to be able to enjoy time with those I love. Today I took it easy all day, stored my energy up so I could visit with my Dad this evening. I sat in the sun, letting it bake me, hoping it could scorch my very bones, heat my body up enough to keep my core smoldering into the evening… I meditated, felt pretty good…. Within half an hour of visiting with my family, the chill came on, then the headache, sore throat, nose started running, chest got tight… My nightly flu. I think I lasted two hours and then abruptly left. Thank god for my husband, I wouldn’t have been able to drive. I took a hot Epsom salt bath and I feel better, more stable, but I have to go straight to bed now. And I’m sad. It makes me so sad. All the people in my immediate family — Mother, Father, Brothers, Sister — are healthy. There may be things I don’t know, but, nothing major. My Dad is going to be 70 next month — he looks great. My Mom is going to be 68 in a few months — she is more physically active than I am. I had recurrent pneumonias as an infant and asthma as a toddler and an undiagnosed thyroid problem as an adult. Is that what set me up for this nonsense? Or is it my Type A, perfectionist, workaholic, control-freak personality, coupled with a high-stress, long-houred job, coupled with the fact that I never exercised, didn’t eat too well and never slept? Genetic predisposition + unfortunate lifestyle + poor career choice + a brain that never shuts off = Myalgic Encephalomyelitis. Lucky me. It’s been two weeks — why isn’t the low-dose naltrexone my miracle drug? I am grateful for my amazing, brilliant, witty, intelligent, savvy, caring, supportive FAMILY. Lucky me (no sarcasm this time). 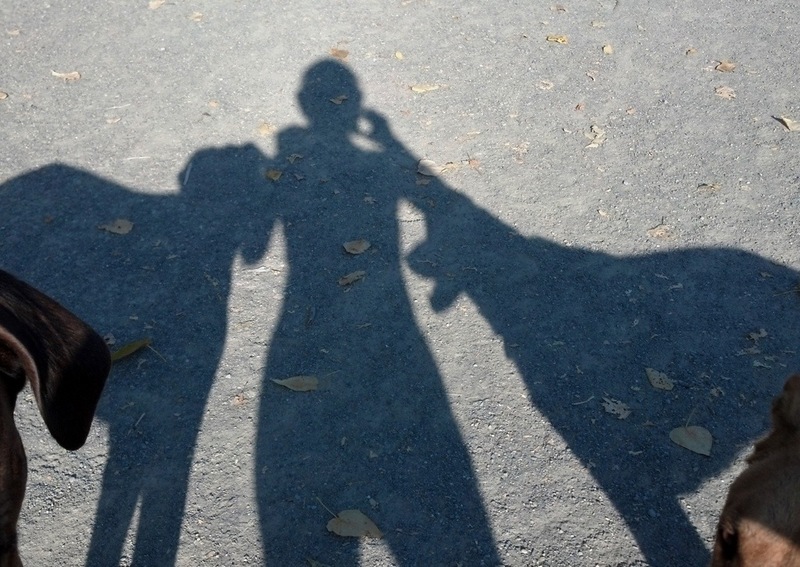 My aforementioned trip to the dog park yesterday. I was weepy, breathless, irritated. Dogs barking and jumping on me caused me to wince and flinch. I avoided eye contact with everyone lest they try to make small talk or ask what kind of dog I have (a very tall Rhodesian ridgeback – he gets a lot of attention). My husband and I went to see a movie. We sat in the middle, as usual, but the screen was too big for me to focus on, so we moved further back. Ten minutes later, we had to leave because the volume left me in extraordinary pain. Afterwards, I burst into tears. I felt rattled, shaken, headachy, fuzzy. I felt like I’d been in a war zone for ten minutes. I went to a baseball game when my best friend was visiting from out of town. The noise was torture. The crowd, overwhelming. The heat, when sitting in the sun, made me feel faint. The chill of the shade made me feel sick. I meditated with my eyes closed to give myself strength, then basically went straight home to bed. Today, I went to the grocery store. This place is huge. Bananas are half a world away from the strawberries. I went in with a list, worked as quickly as possible, but, it was crowded — families everywhere, carts colliding — I gave up eventually, went back to the car and let me husband check out. I thought I would pass out or puke or both. There have been so many instances like this. It’s not anxiety or phobia or fear causing it, but, of course, now there is anxiety wondering how a situation will affect me. And wondering whether I will ever be normal again. Whether I will ever again have a high threshold for bright lights, loud noises, multiple conversations or big crowds. I want to be able to go to a concert or the cinema. I want to be able to watch fireworks or go to a party. I want to be able to go to a mall or a grocery store or an airport. I caught a sensitivity virus. Sensitivity to noise, lights, sound, heat, cold, foods, drugs, alcohol, chemicals, animals, touch… I don’t want to be a hermit or antisocial. I don’t want to live in peace and quiet! … I’m forced to. If, one day, you see my screaming and dancing in a mosh pit at some extremely loud rock concert, just know it is a good thing: I am jumping for joy. LDN Day 6…a better night. Last night, I slept better than I have in the past 5 nights. That doesn’t mean I slept well, but I slept better. I think I might have actually hit 8 hours. Zeo says 6 hours and 50 minutes but it looks like the headband fell off or lost contact with my forehead for over an hour. I still had crazy dreams (about saving my dogs from danger. I always have this dream. What do parents of human children do? I think I would never stop dreaming about keeping them safe). I also woke up with no blood in my arms multiple times and pain in my neck, as usual, but what was different from the other nights? Well, yesterday, I got a bit of exercise at the park (walking slowly, but something), I used arnica and took a painkiller for the muscle pain, I took my antihistamine nasal spray twice, I used my neck stretcher thingy (like a mini-rack for your spine), I did mild leg and arm stretches, I didn’t eat last night after 5 or 6pm, and I did a little mental preparation before I went to sleep, telling myself that everything was great and the diet would be exciting and tomorrow I would have energy and, oh, I LOVE bed! (lie ~ this year, bed has become all things bad) Also, the temperature dipped last night and my room was much colder than usual (which is typically not a good thing for me because I get chilled and my head and ears get cold. Back in January, when this sickness started in earnest, I would wear a woolly cap to bed every night, as well as have the electric heater on, as well as cuddle a hot water bottle. I’m going to invest in an electric blanket this winter). I don’t know what, if anything, helped me get more sleep, but I want to track it. I know if I just popped a bigger, better painkiller and a muscle relaxer, I would sleep much better, but I still refuse. It freaks me out. If I stop the LDN, maybe I will try other options, but, for now, one drug at a time, sweet jesus. Today, I am stiff and achy, of course. My eyes are VERY swollen. I am going to chalk that up to sleeping longer and maybe a bit deeper and pretend it is a good thing. My hands still hurt and are swollen and the left thumb is still one raw nerve. Oh, I keep forgetting to tell you about this one crazy side effect I’ve been having at night since starting the LDN. I wake up in the night from a light in my eyes, but, when I open them, the room is black. This keeps happening! From behind closed eyes, I think someone has opened the blind or something, but when I come fully awake and open my eyes: darkness. Bizarre. Also, LDN seems to be affecting my skin ~ I have a bit of a break out on my chest (never happens) and face. Yesterday, I did make it to the dog park, but not the pharmacy or the grocery store. I was just so wasted and the weather was crappy. So, I haven’t started the diet or the supplements yet. I’m having my tea with milk and splenda and savouring every sip. The Good Doctor dropped another bombshell about my diet late last night via email: NO BEANS. That means NO PEANUT BUTTER, NO HUMMUS. That kills me. Hummus can replace so much ~ eat it with veg to feel more full, put in on sandwiches (or, in my case, lettuce wraps. Yum), baked hummus chicken is good… But peanut butter I will truly mourn. Peanuts are my go-to food. She also said it is essential to have no refined sugar. That made me want to punch her in the face. If you ever read this, Good Doctor, I don’t really mean that. I don’t want to hurt you, you are my only hope, but I am just so overwhelmed by what I have to do, what I can’t do, how NOT easy eating is going to be. I’ll start the diet tomorrow. I promise. I’ll go shopping today. I’ll have to make homemade soups. Lots of homemade soups, salads, nuts for snacks and … what about breakfast? I still feel discouraged about breakfast. I’ll have to develop a liking for the fake yogurts made with soy or coconut milk. I could add fruit and crumbled Lara Bar and pretend it’s granola or muesli. Then, to stop my blood sugar dropping, eat a bunch of almonds. This is going to fun. You are going to feel great. Have I mentioned my blood sugar? If I have, forgive me ~ no memory. I have reactive hypoglycemia. I can fast for 10 hours and my sugar is fine, but, as soon as I eat breakfast, I have to watch out. An hour or two later (depending on what I had to eat), my BS plummets. I usually catch it in the 60s and 70s, once I start to feel the shakes. Last week, it was 58. The week before it was 43. That’s low. Way too low. It had an effect on my whole day. So, now I am trying to be very mindful of what I eat in the mornings. Ugh. I am so tired. I had another terrible night. I took the LDN and was in bed at 10pm and didn’t get up until 9am. In 11 hours, I managed to get 6.5 hours sleep. I woke up constantly again. (Check out the Zeo graph. “W” at the top = “wake”) I had to go to the bathroom constantly. I was uncomfortable and in pain. I had crazy dreams. I was sweaty, but cold. Extreme hunger finally forced me out of bed. Ugh. There’s this thing I do in my sleep that always wakes me up. I wake up with all of my muscles tensed from head to toe, my back in an arch, my hands in fists, my arms and legs rigid, my jaw clamped down so hard it feels like my teeth might break (and they have). I have no idea why it happens or how to stop it, but I am always afraid that I am going to throw my neck out while doing it. I have degenerative disc disease issues in my neck (cervical spine). When my neck goes out, it is the most acute pain I have ever experienced in my life. I am paralysed when this happens. I have been seeing a physical therapist for years with minimal progress. She said I had the worst case of hypermobility she had ever treated. I have an at-home TENS unit (transcutaneous electrical nerve stimulation) which I use every day. It helps me not have to use pain killers and I basically stopped going to the PT, because now I have the equipment they use at home. Today, as I type this, I have it zapping my back and neck ~ I tweaked something in the night with all the tensing and thrashing about. I haven’t had a “good” day since the day I started LDN. I have felt fluish and chilled every day this week. The pain in my back, shoulders and neck makes it difficult to do much ~ even walking up and down the stairs. My chest is tight the past 5 days and my nose is either running or stuffed up. My hands ache. My left thumb has been virtually useless for days because there is a painful electric jolt that runs down it every time I press it into a certain position. After lunch yesterday with my friend, I had planned on going shopping for groceries and supplements for the new regimen, but, after two hours of visiting, I was weak, felt faint, my muscles were buzzing, my concentration was totally shot. I was having such a hard time focusing on our conversation and the responses I should give… That doesn’t happen a lot to me. I have had some cognitive disturbances with memory, but having to put so much effort into focusing on what you are hearing and what you should say… that’s a new one. I would love to tell you about the stool sample kit that I have to do, but I won’t. It might be the most disgusting thing I’ve ever dealt with. Well, that’s not true. I’ve dealt with more disgusting things (work in an elderly care facility and restaurants long enough and you see things you don’t want to). In fact, I’ve experienced more disgusting things just surfing the internet. Today, I am determined to go to the dog park, the pharmacy and the grocery store. I’m determined to finish the laundry and laugh and PLEASE GOD get a better night’s sleep. Maybe I should take a melatonin…. but I hate mixing drugs. Stay tuned.